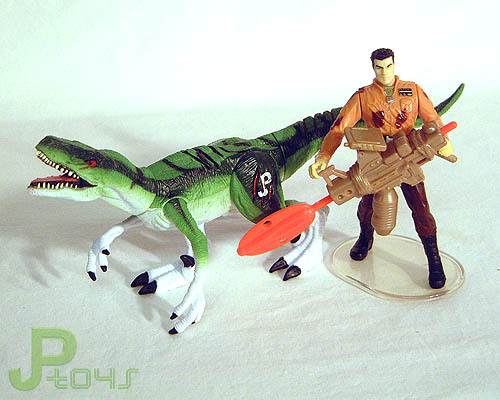 Action feature: TLW Cyclops Raptor repaint. Trooper is JP3 Military General repaint. Description: unlike most other original Kenner dinosaur sculpts, this Raptor stands in a very active pose, with its legs in a walking mode, left arm outstretched and right arm held back, its head raised upwards and its mouth opened. The animal takes on an attack posture and looks ready to jump on an adversary with an agitated overall look. It has seemingly every right to be agitated since its body shows numerous signs of near misses with larger carnivores: it has scratches and scars all over his body, some small and hardly noticeable, others large and plain in sight. The largest scars look like claw marks and can be found on its back, its tail and both legs. Other noteworthy signs of abuse are the end of the tail, which isn't just bent, but looks more like the bone has been broken and caused a deformity, as well as scratches on the left eye. Also a point of interest, this figure has rather large feet to keep it from falling over (though it often does so regardless when not leaning on the left arm). Its sickle like claws are a bit small and the toe they're on is stuck way too much towards the back of the foot. This Velociraptor has a very simple attack action which has little to do with its attack posture. When the tail is moved from side to side, the head swings along as if the animal is making snapping movements. This Raptor sports a rather intricate paint job. Though its underside (lower jaw, throat, belly, lower part of the tail and most of the arms and legs) is simply dull white, the top parts of the figure's body are much more detailed. The dominant colour is light green, which is most notable on the back, top parts of the limbs and the tail. Darker green stripes run over this lighter shade of green: a pair of them runs from the snout over the neck and back all the way to the end of the tail on each flank of the figure. Additional dark green stripes are found on the upper arms, while on the legs they from a big 'pear' shaped form. Small black stripes in random patterns are seen on the neck, back, upper legs and front half of the tail. The various gaping wounds on the figure's legs, left eye, back and tail are coloured bright red, giving the figure a definitely bloodied look. The eyes themselves are also coloured red, with black pupils and black eye liners. The sides of the mouth are coloured black, while the inside of the mouth is pink (and seems to be missing a clearly definable tongue! 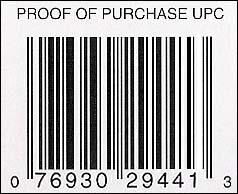 ), and the figure sports white teeth. The Raptor also has black claws on its hands and feet, and a white JP logo on its left upper leg. 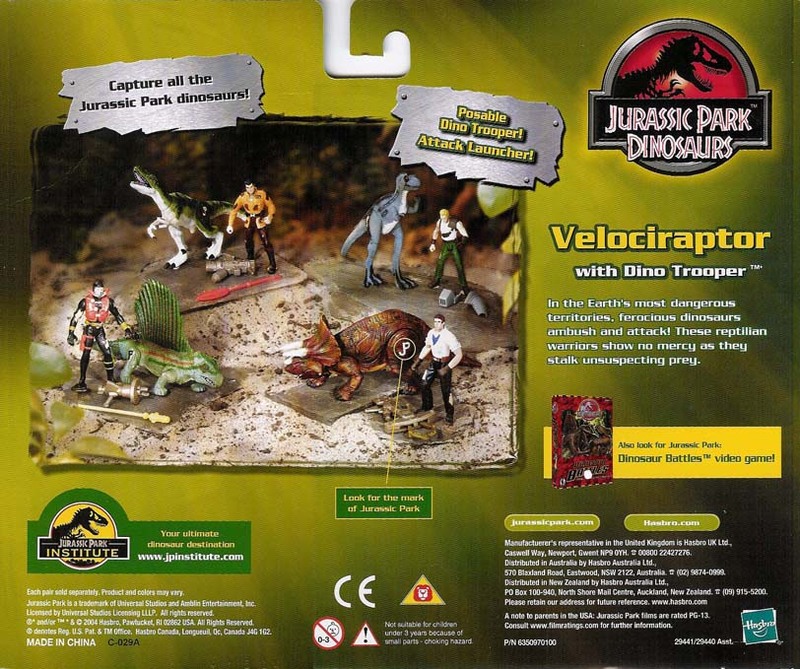 The Dino Trooper figure wears an orange (or light brown) jacket with dark brown spots and shapes on it and revealing a grey shirt underneath, as well as silver tags around his neck and golden insignia on his chest. He also sports a black utility belt with a silver clip, dark brown trousers (with black specks mixed in) and black boots. His trousers and shirt sport some slight tears, like he's had a conflict with an unpleasant dinosaur. He has black hair and eye brows, small green eyes and a rather grim look on his face. He stands in a very odd pose, left leg stretched forwards and right leg bracing backwards, left arm reaching up and right arm pointing down, as if he's very startled by some prehistoric monster in front of him. His missile launcher is painted in a light brown colour: it can be loaded with a red missile, which is basically a stick with a large oval shape with two round holes in it at one end. Pushing the end of the stick makes the weapon being fired, sort of. Analysis: another often repainted TLWS1 figure used for JP: Dinosaurs 2 is this Cyclops Raptor, which doesn't live up to that original name because both eyes seem to be working fine, despite the heavy damage inflicted on this poor dinosaur. 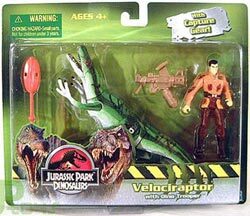 The package calls him simply Velociraptor, but Battle Scarred Raptor would suit him better. The scratches and huge scars have been present on this sculpt since day one, but this is the first time the toy designers actually make good use of them and paint them differently to enhance the poor health status of this Raptor. It works to great effect and makes this figure stand out excellently compared to its previous incarnations. The rest of the paint job works fairly good too, thanks to the different shades of green on top of each other and the various details like the black stripes, eyes and claws. The only real downside is the undetailed underside of the figure, which just seems like it was never painted at all and remained dull factory white. This white itself conflicts with the green and causes an ugly interplay between both colours, but because of the figure's stance most of this bad colouring remains unseen, except for its use on the limbs (and on the JP logo), so it causes only a minor grievance for the paint job as a whole. This Raptor still features a wiggly head attack option. It works okay, but it seems like the tail won't move as far as before, making the action a little less effective. Repaint: yes. This is a repaint of the TLWS1 Cyclops Raptor, which was repainted twice before for JPD1 and as a JP III Exclusive. The Dino Trooper is a JP III Military General repaint with repainted missile launcher. The Trooper would be repainted again for JP 2009 (sans weapon), but this would be the last time this Raptor sculpt got released. Overall rating: 7/10. This Raptor sports quite a cool and detailed paint job, finally making full use of all the scarring and wounds on this sculpt, but the figure itself is still not great. The Trooper is a not very impressive repaint of a lousy figure with a boring weapon, which does do some damage to the set's overall appeal. 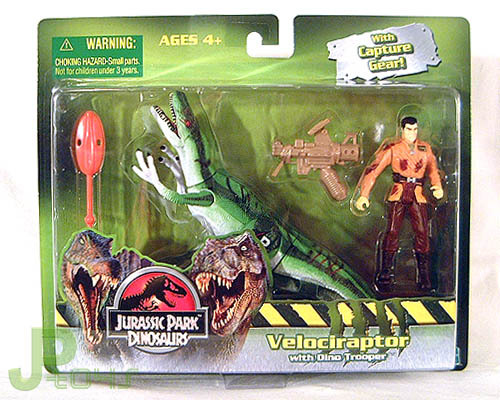 Like all four dino/human two-packs, this is one of the more common JPD2 releases, and it can still be found without little trouble, usually (but not always) for decent prices.